Certified 10th Duan by T.W.K.S.F. Grandmaster Huang completed his academics by completing his college education, earning a B.S. degree from the National Chung Shing University, Taiwan, R.O.C. Since then, he developed his dedication for Kuo Shu and has trained in it for over 50 years and taught for more than 40 years. In his devotion to this doctrine, he founded and served as Chairman and first term President of the World Kuo Shu Federation, and, in 2006, was re-elected for a second term. He finished his second term in 2010 and currently serves as Chairman of the Board. He is also President of the United States Kuo Shu Federation, and in 2000, he was the first inductee into the Kuo Shu Hall of Fame. Since 1988, Grandmaster Huang has promoted and sponsored numerous national and international Kuo Shu championship tournaments; from 1986 to 2000, he served as Head Coach of the United States Kuo Shu Team, which competed in the World Cup and other international tournaments. Grandmaster Huang has been called the “Maker of Champions” because of the many competitions his students have won in forms, weapons and full-contact Lei Tai fighting. In addition to his students winning World Lei Tai Championships, at the 2nd World Kuo Shu Federation Tournament (Singapore, 2006) and the 3rd World Kuo Shu Federation Tournament (Germany, 2009), his students also won Gold medals in Tai Ji Quan form, weapons, and Push Hands. 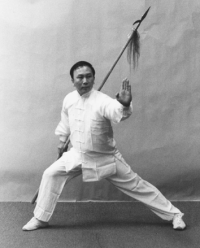 Grandmaster Huang founded the U.S. Kuo Shu Academy in Owings Mills, Maryland, USA, and teaches Tien Shan Pai Kung Fu, along with other Northern styles, as well as Tai Ji Quan, Xing Yi Quan, and Ba Qua Zhang. He was Director and Chief Arbitrator of the 7th World Cup Chinese Kuo Shu Championship in Taiwan. Grandmaster Huang is the only full heir to the 63rd generation Tien Shan Pai Supreme Master Wang Chueh-Jen, “the Double Broadsword King of China”. As the outstanding supporter of Tien Shan Pai in the world, Grandmaster Huang has concentrated his efforts in the arena of the United States, Europe and South America. He is known internationally as “Kuo Shu World Bao Qing Tian”; China’s most famous judge, and is an international Kuo Shu Coach/Instructor and international Kuo Shu Referee “A”, the highest ranks, by the International Chinese Kuo Shu Federation (ICKF). In 2004, Grandmaster Huang received his 10th Duan degree, the highest rank from TWKSF and was certified at the 10th Duan level by the World Traditional Martial Arts Union. Grandmaster Huang travels around the world teaching seminars on a variety of topics, including Dao Meditation, and he has produced videos on Tien Shan Pai, Qin Na, Tai Ji Quan, and Xing Yi Quan. He designs and implements instructor, judge and referee certification programs, and has also introduced a new grading and ranking system for TWKSF. He has been an adjunct professor in Tai Ji Quan at the Community College of Baltimore County in Essex, Maryland for over 25 years, and formerly taught Tai Ji Quan at the Peabody Institute in Baltimore, Maryland. He has spent much time assisting in the training of Lei Tai full-contact fighters from the United States and other countries; these fighters have gone on to win full-contact competitions at national and international Kuo Shu tournaments, including the World Kuo Shu Tournament. Grandmaster Huang has had television interviews in the United States and Spain, and, in Paraguay and Brazil. He was on the news show PM Magazine in a feature on “Maker of Champions, Builder of Character.” In addition, he has performed in the United States, Europe, China and Taiwan. Grandmaster Huang’s commitment and contributions to charity work have continued to serve and benefit people far beyond the martial arts community. He has supported many charitable events for organizations including the Muscular Dystrophy Walkathon, Pride of Baltimore II Rebuild, and The Johns Hopkins Children’s Center. In 1998, he performed Tien Shan Pai Kung Fu with his students to raise more than $5,000 for the National Multiple Sclerosis Society. In November 2001, through a martial arts demonstration, Grandmaster Huang and his Kuo Shu team raised more than $2,700 for victims of September 11, and, in 2005 they conducted a fundraiser for St. Jude Children’s Research Hospital and raised more than $4,000. 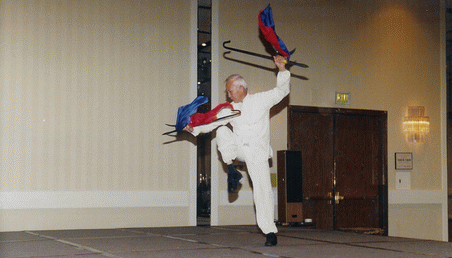 In April 2008, the International Tien Shan Pai Association and the USKSF sponsored a charity demonstration to celebrate Grandmaster Huang’s 35 years of instruction in the U.S. and raised over $4,000 for the Baltimore Children’s Home. Most recently, over $6,000 was raised for the local charity, “Sparks of Change,” during a demonstration to celebrate Grandmaster Huang’s 40 years of teaching in the U.S. Baltimore County Executive Kevin Kamenetz proclaimed April 26, 2013 as “Huang Chien Liang Day” to celebrate this achievement. Locally, Grandmaster Huang has been invited to meet with many state and federal officials, including Robert L. Ehrlich (former Congressman and Governor), C.A. Dutch Ruppersberger (former Baltimore County Executive and current U.S. Congressman), Andrew Harris (former State Senator and current U.S. Congressman), and Parris Glendening (former Governor). He has received Certificates of Special Congressional Recognition from U.S. Senator Barbara Mikulski, U.S. Congressman Ruppersberger, and then-Congressman Ehrlich; a Citizen Citation from former Baltimore Mayor Kurt Schmoke; County Executive Citations from Hayden, C.A. Dutch Ruppersberger, James T. Smith and Kevin Kamenetz; and Governor’s Citations from former Governors Glendening and Ehrlich, and current Governor Martin O’Malley.